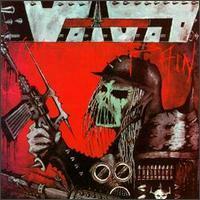 War and Pain is the debut album from Canadian thrash metal/progressive metal band Voivod, which was released on August 10, 1984 through Metal Blade Records. According to a 1986 TV interview with the band, it sold over 40,000 copies within 2 years of its release, but the band only got paid $1,000, accordingly to the contract they had signed with Metal Blade. War and Pain was reissued several times on the CD format (sometimes on different labels in other countries): in 1990 on Enigma or Roadracer Records; remastered by Metal Blade and reissued in 1994; it was also released in Roadracer's Pricekillers series (also 1990); and again by Metal Blade in 2004 as a remastered 3-CD boxset (see the 20th Anniversary Edition section for the bonus material).